Or so the saying goes. But do two? Probably not if the plummeting temperatures this evening are anything to go by. 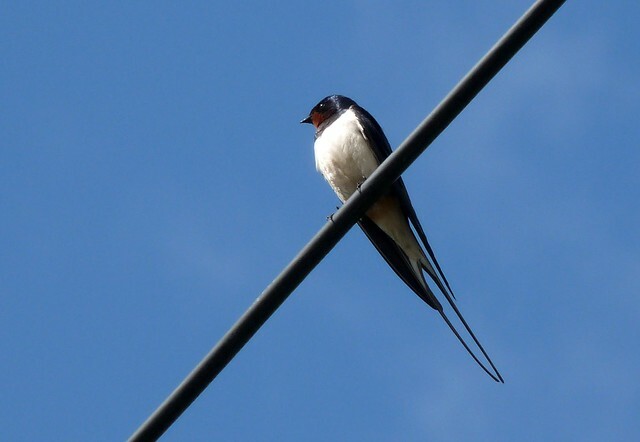 I spotted the above pair of Swallows sitting on telegraph cables on the drive back from having my hair cut this morning. Unfortunately I didn't have my camera with me at the time so walked the couple of miles back to the location after first returning home to collect it. I wasn't really expecting them to still be in the same place but to my delight they were. Judging by the length of the tail feathers I think this is probably a male and a female and they looked well settled. The male in particular was very showy allowing me to get my best photos to date of these spectacular birds. 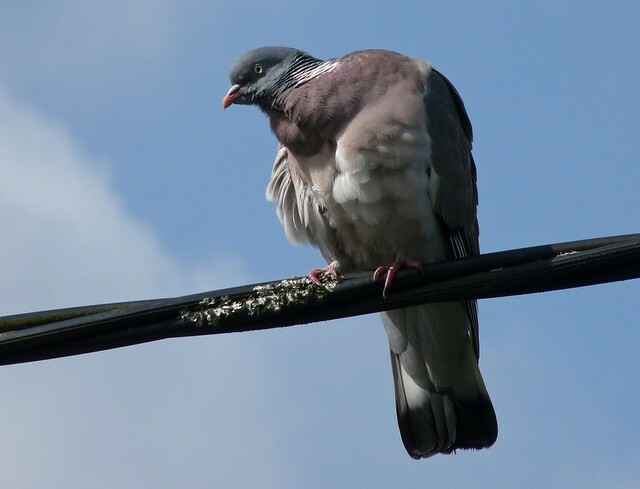 Closer to home a Wood Pigeon was pulling some moves, again from an overhead cable. We may often moan about pylons and cables spoiling the view as they crisscross our landscape, but the birds certainly seem to make the most of them. I have even read that the removal of these handy perches has actually made it harder to watch spring migration in action from places such as Strumble Head in Pembrokeshire, as the birds now just fly straight over and carry on inland. It's funny how our efforts to return areas to a more natural state can have unexpected impacts such as this. Lovely shots of the Swallows Adam. Had a few here recently. Great point. Birds do no complain, they adapt! Excellent photographs Adam. 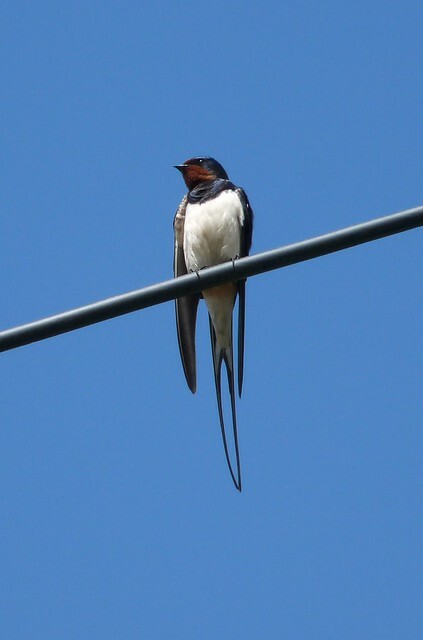 I saw my first Swallow in Cheshire last week. Lovely to see them back. Amila, Keith - thanks very much. Springman - They certainly do. More than we realise sometimes. Andrew - It's great to have them back. WOW, beautiful captures of the Swallows! Great to see this migrant back here on the wing. Excellent shots Adam. They're all great shots Adam!! Boom & Gary of the Vermilon River, Canada. These are all marvelous shots Adam! Those Swallows are beautiful with their long tails and iridescent feathers. I love the picture of the Wood Pigeon posturing for you! Great point about the overhead wires! It is springtime and all the birds are putting on a show. Love the post. Boy thos swallows have long tails compared to here. I`m always moaning & groaning over the lines in the way,but you are correct. 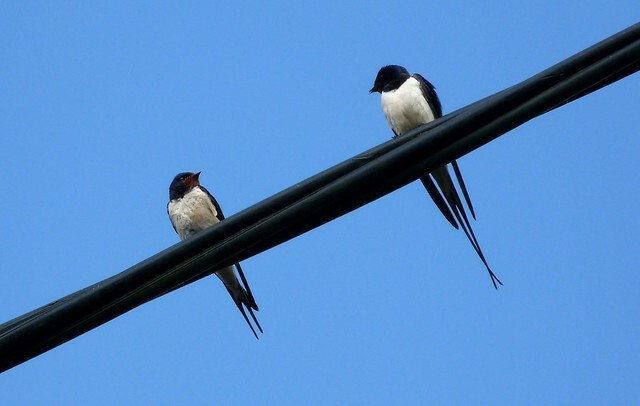 They are pretty swallows with their long tails. Wonderful photos. Wow thanks everyone for your kind comments. Fantastic tail! 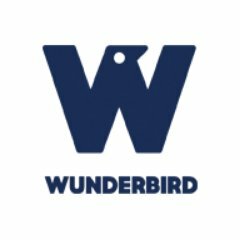 Great photos and interesting blog.